From our office proceed up Station Road West and bear left into Station Approach. At the T junction turn right, proceed under the railway bridge and at the mini roundabout take the first turning on the left into Chichele Road. Proceed up Chichele Road and then turn right into Silkham Road. Take the first turning on the right into Field Court and number 3 will be found on your left hand side. 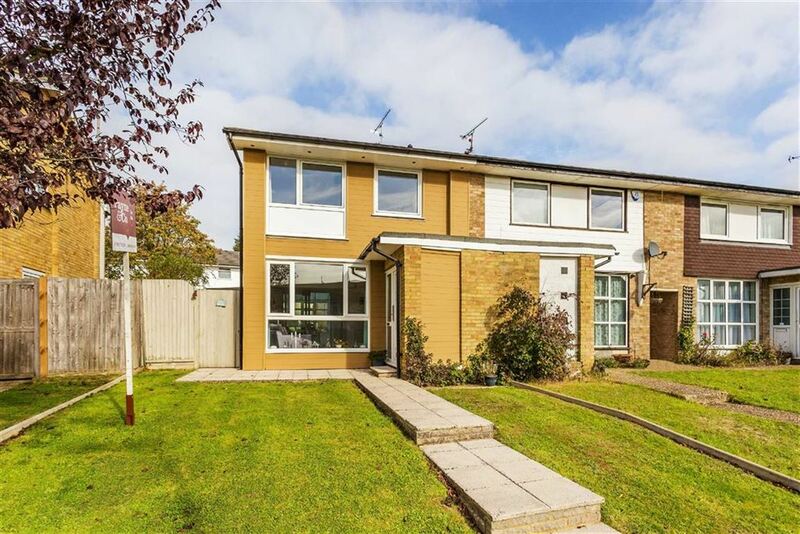 A very well presented property with benefits including conservatory and garage, situated in a cul-de-sac location in close proximity to local schools and Oxted's town centre and commuter railway station (London approx. 40 minutes). Coat cupboard (fuse board and electricity and gas meters), door to and stairs to first floor. Rear aspect double glazed window, range of white high gloss eye and base level units, wood effect work surfaces with inset stainless steel sink and drainer with mixer tap, and four ring wipe clean hob with oven below and extractor over, spaces for dishwasher and tall fridge freezer, door to utility cupboard (space and plumbing for washing machine with shelving above, tiled splash backs, laminate flooring. Double glazed pitched roof over double glazed windows and double doors on a brick plinth, radiator, power points, wall lights. Rear aspect frosted double glazed window, three piece white contemporary sanitary suite (comprising close coupled w.c with dual flush, pedestal wash hand basin with mixer tap, shower bath with integrated controls and glass shower screen), ceramic tiled flooring, part tiled walls, ceiling spotlights, laminate flooring. Front aspect double glazed window, radiator, integral double storage (shelf and hanging rail) and integral over-stair storage (shelved). Rear aspect double glazed window, radiator, integral double storage. The front garden is laid to lawn with footpath leading to front door and paving around the side of the property via a side gate and a garage is located in a block close by. The rear garden comprises a patio adjacent to the rear elevation beyond which a couple of steps lead up to a lawn area edged with a shingle path either side. At the far end of the garden is an attractive further patio which acts as an ideal entertaining area. Fenced enclosed. There is a garden shed at the side of the property.